Corra proved it again. She has the talent and speed as well. Following the instructions in my step by step pictorial tutorial for Sparkly Crystal Ring, she completed her first ever ring in 10 minutes! That is really something. 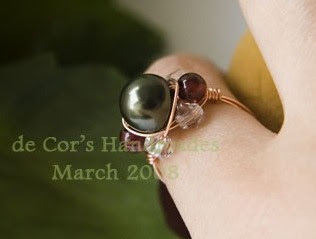 When I first started making rings, I spent about half an hour for a simple wire wrap ring. For this short time that I know her (less than a month), she is a great photographer as well. If you would like to see her pretties and great photographs, visit Corra's blog decorshandmades.blogspot.com. She will be angry with me for cropping her pictures smaller here. She mentioned somewhere that she hates to crop her pictures. 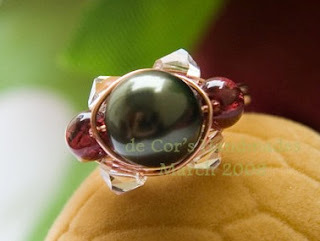 But Corra, I just want to show the details of the ring you created here :). Sorry ya! Speaking of speed, where can you find someone who created 3 tutorials within a time span of 3 months from the time she discovered wire jewelry? Labels: Rings , Wire Jewelry , z Jewelry Friends n Artists Share it! LOL Mei, it's ok cropping the picture - i understand.